The last update to NVIDIA's Android-powered SHIELD game machine was only a month ago, but there's another one waiting in the wings. 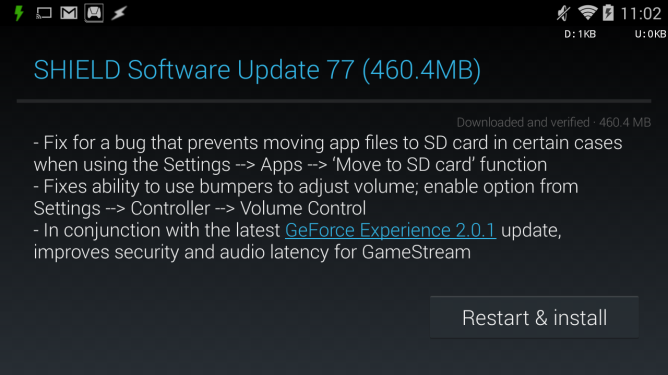 Since SHIELD is already running the latest version of Android, this is a maintenance update, but NVIDIA seems to be sending the full software image (460 megabytes) anyway. SHIELD users should see it pop up on their screens sometime today - make sure you're near a speedy WiFi access point before you begin. So what's in there? According to the changelog, just three things: an Apps2SD bug fix, a bug fix for the bumper button volume function (much easier than using the on-screen virtual volume keys), and better security and speed for the GameStream service. That's all there is, there isn't any more. In order to get the latter working with your NVIDIA GeForce-equipped gaming PC, you'll need the latest version of GeForce Experience installed - download it here. Don't mistake my flippant tone for dissatisfaction: while NVIDIA could probably optimize its file sizes a little better, their software support for SHIELD has been exemplary thus far. (My DROID MAXX has had a home button bug since the KitKat update in January.) SHIELD owners, check your Settings>About Device menu if you don't see the over-the-air update coming in.